The AAN and other medical specialty organizations have been working to address concerns about the requirements for maintenance of certification. National specialty medical societies, including the AAN, have joined forces with state medical societies to demand significant changes to the long-controversial processes by which physicians maintain their board certifications. Current maintenance of certification (MOC) programs have become so unpopular that state legislatures are moving to limit the significance of MOC and some physicians are opting out of the predominant recertification system entirely. At issue is the multi-step process of maintaining certification and, perhaps more fundamentally, the deep distrust between those that control MOC and those who are controlled by it. In the face of growing criticism, the American Board of Medical Specialties (ABMS) and its 24 member boards, including the American Board of Psychiatry and Neurology (ABPN), recently launched a multi-stakeholder initiative to reconsider the system of continuing board certification. Based on the ABMS actions in recent months, Rydell said she is encouraged that meaningful changes may be at hand. But years of perceived disrespect will not be eliminated easily. When neurologist Frank McDonald, MD, MBA, president of the Medical Association of Georgia, started practicing medicine, the original certification from a specialty board — in his case, the ABPN — lasted throughout a physician's career. Today, certification must be renewed every 10 years by meeting four criteria: 1) professional standing, as evidenced by a valid medical license; 2) participation in continuing medical education (CME); 3) success on a written examination — the so-called “high-stakes exam” — evaluating knowledge, judgment, and skills; and 4) completion of Performance in Practice (PIP) activities involving chart reviews, peer feedback, patient feedback, and other tasks. “Every cycle they are coming out with new requirements, and some of it seems like just busy work,” said Dr. McDonald, a general neurologist in Gainesville, GA, and immediate past president of the Georgia Neurological Society. In recent years, physicians have grown increasingly frustrated for three reasons, he said. First, while board certification is technically optional, so many hospitals and insurance companies use it as a credentialing criterion that, in effect, maintaining certification is essential to practicing medicine. Second, physicians don't believe some of the MOC components — in particular, PIP activities — are relevant to their practice. “There's absolutely no data that says jumping through all these new hoops they're putting up makes any difference in competence,” Dr. McDonald said. Lastly, physicians have no way to provide input into the MOC process by which their livelihoods are controlled. In 2017, the frustration turned to action. “Physicians... weren't getting the response they wanted from their respective boards, so they came through the state medical society to then have action taken through the state legislature,” said Donald J. Palmisano Jr., JD, executive director and CEO of the Medical Association of Georgia. At the association's behest, the Georgia General Assembly passed a law that prevents the state from requiring MOC as a condition of licensure, employment by a state medical facility, or for insurance panels or malpractice insurance. Georgia is not alone. Bills in at least 15 other states have either passed or proposed some restrictions on the use of MOC. Like many other physician leaders, Dr. McDonald is worried about the General Assembly legislating physician credentials —”that's kind of a slippery slope,” he said — but he thinks many members of Georgia's medical association saw legislation action as their only recourse. “The practicing physicians are just fed up and saying ‘we've had enough,’” he said. Paul G. Mathew, MD, FAAN, assistant professor of neurology and advanced neurology clerkship director at Harvard Medical School, reports on such legislative restrictions when he testifies before state legislatures that are considering proposals to curtail MOC or presents to state medical societies whose members are agitating against MOC. His frustration with ABPN led to his becoming an advisory board of the National Board of Physicians and Surgeons, which offers an alternative to the MOC process required by ABMS and its affiliated boards. The board requires initial certification by an ABMS specialty board, but it recertifies physicians if they meet annual CME and other requirements. “We believe that it's very important for physicians to stay up-to-date, but we also believe that subjecting physicians to unproven modules, high-stakes testing, and excessive fees really don't fit with the learning needs and interests of the individual physician.” Dr. Mathew said. He started questioning the ABMS approach to MOC after attending a presentation about the process at the AAN's 2014 Annual Meeting. Dr. Mathew started a petition asking the ABPN to eliminate the MOC Part IV — PIP — activities from the process. Over the next year, he submitted nine letters — the most recent one had nearly 1,100 signatures — to the ABPN and ABMS, seeking action. “There were chairmen of departments, chiefs of divisions, members of [the National Institutes of Health], and even physicians outside of neurology signing on,” he said. He felt buoyed when the AAN later issued a position statement calling MOC Part IV “an unnecessary, onerous requirement” and urged the ABPN to repeal it. The American Psychiatric Association issued a similar statement. But the communications appear to have been for nothing. “I never actually heard back from the ABPN,” Dr. Mathew said. Rydell belongs to the Specialty Society CEO Coalition (S2C2), which represents about 30 of the largest national medical specialty organizations. In recent years, MOC has been a frequent topic of discussion among its members. “We continued to hear more and more issues raised by our members who are trying to meet the criteria and asking where the data are to support that this truly or assures quality care,” she said. Meanwhile, the American Association of Medical Society Executives (AAMSE), representing 300 state and local medical societies, has been hearing the same complaints from their members. The situation took on a new dynamic in July when Rydell, Palmisano, and a small group of other executives from S2C2 and the AAMSE came together to discuss MOC. “I've been in this business as a state CEO and now as a national CEO for 25 years, and this is the first time that those two organizations — representing all the physicians in the country — have actually met face-to-face to talk about an issue of common concern,” Rydell said. That meeting prompted a letter, submitted on behalf of 41 state medical societies and 33 national medical specialty societies, to ABMS. Using the term “crisis,” they announced a meeting at which leaders from ABMS and the certifying boards could hear the concerns of the medical specialty societies and state medical societies. Stakeholders gathered in Schaumburg, IL, on December 4 to share their perspectives in a series of panel discussions. A summary of the meeting said society executives “articulated the anger and distrust of physicians about the boards and a shared perception that the boards are dominated by academics and executives who have lost touch with the needs of the community physician. ABMS leaders appear to have gotten the message. Just weeks after the small group of S2C2 and AAMSE leaders met, the ABMS announced the Continuing Board Certification: Vision for the Future initiative. At the December meeting, Lois Nora, MD, JD, MBA, president and CEO of ABMS, “assured the group that this initiative is a sincere effort to engage all stakeholders,” according to the meeting summary. “While the [ABMS] member boards have and continue to make substantial changes in their programs, some physicians still view the current process as irrelevant, burdensome without proven value, and costly,” Susan C. Morris, ABMS director of communications, said in a written response to Neurology Today's questions. In February, the ABMS announced the members of the Commission. Among them is Rydell, of the AAN. The Initiative is designed to include a wide range of stakeholders — physicians, professional medical organizations, national specialty and state medical societies, hospitals and health systems and patients, as well the ABPN and 23 other boards. Physicians can provide input via a national survey, formal commentary opportunities and hearings, or submitting comments to the Vision Initiative website. Portions of the Commission meetings will be open to guests, allowing them to hear testimony, presentations, and discussions; Commission members will also meet in closed sessions, Morris said. The Commission's draft report for public comment is slated to be released in November. Dr. McDonald was encouraged by the comments he heard at the meeting. “It may be too little too late, because when I got that message back to the members of our society, a lot of people said ‘well, that's just talk,’” he said. But he was further encouraged when, in mid-December, the ABPN announced its plan to pilot-test an alternative to the 10-year high-stakes exam. A number of ABPN diplomates will be invited to use the “professional journal article-based assessment activity” beginning in 2019. Both Palmisano and Rydell said they believe ABMS and board leaders are sincere in their desire for a collaborative approach to redesigning MOC. The S2C2 leaders want to see “transparent, frequent and consistent communication with all stakeholder organizations at the state and national level,” Rydell said. •. Gilman DJ, Miller BJ, Goldstein B. Board Certification: A dose of competition, Health Affairs blogpost; Nov. 29, 2107 http://bit.ly/blog-HAffairs. •. Teirstein PS. Boarded to death — Why maintenance of certification is bad for doctors and patients https://www.healthaffairs.org/do/10.1377/hblog20171121.748789/full/. N Engl J Med 2015; 372:106–108. 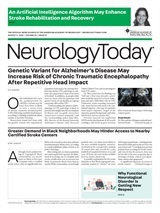 Neurology Today18(6):1,27-33, March 22, 2018.